San Fabian – 28 November 2009. 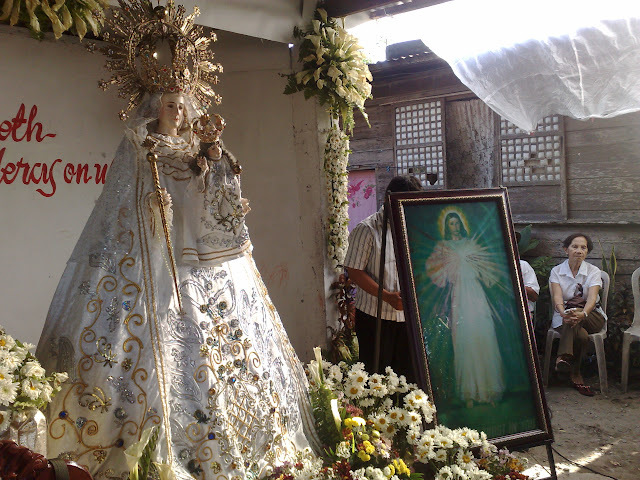 Barangay Poblacion welcomed the image of the Divine Mercy and the Blessed Virgin Mary as part of the Visitation Program of the Parish. The Visitation refers to the visit of the image of the Divine Mercy and the statue of the Blessed Virgin Mary to a barangay for one week. Barangay Poblacion, however, had their Visitation for only five days from 23-28 November. This was because the images stayed in Barangay Sagud Bahley for two more days due to the Vicariate celebration of Christ the King held last 30 November. The Farewell Mass was held on 28 November 2009, Saturday. The Sacrament of Baptism was celebrated after the mass. A procession from Barangay Poblacion to Barangay Nibaliw Sabangan was held. The Holy Mass was held at the Corpuz residence where the images were also kept for the nightly vigil. To see more pictures of the Visitation in Barangay Poblacion, please click HERE. San Fabian – 27 November 2009. The more than 50 corros or Cenacle Groups of 30 members came together to celebrate the Feast of the Miraculous Medal of the Blessed Virgin Mary. A procession was held at 5:00 AM with the different corros brining with them their statues of the Blessed Virgin Mary. The members of the families of each corro took part in the procession. The Holy Mass was celebrated after the procession. Fr. Oliver E. Mendoza, the parish priest, celebrated the Mass in honor of the Blessed Virgin Mary. The Miraculous Medal comes directly from the Most Blessed Virgin Mary, Mother of God and our Mother; it is a gift from heaven which has never ceased to effect marvels of grace throughout the entire world. This medal is a very simple and very efficacious means to benefit from the protection of Mary in all our necessities, both spiritual and temporal. On November 27, 1830, in a residence of the Daughters of Charity, at the Chapel of the Rue du Bac in Paris, the Most Blessed Virgin appeared to Saint Catherine Labouré (1806-1876) for the second time. On this day the Queen of Heaven was seen with a globe under Her feet and holding in Her hands, at the level of the heart, another smaller globe, which She seemed to be offering to Our Lord in a gesture of supplication. Suddenly, Her fingers were covered with rings and beautiful jewels; the rays from these streamed in all directions. The Blessed Virgin looked down on the humble novice who was contemplating Her. “Behold,” She said, “the symbol of the graces that I bestow on those who ask Me for them. The jewels which remain in the shadows symbolize the graces that one forgets to ask Me for,” the Virgin continued. And Catherine Labouré wrote later, “She made me understand how generous She is towards persons who pray to Her, how many graces She grants those who ask Her for them, and what joy She has to bestow them!” Then there formed around the Mother of God an oval background on which was written in gold letters: O Mary, conceived without sin, pray for us who have recourse to Thee. The oldest corro or circle of members of 30 families is Corro 1. It was formed in the late 1930’s. The present members of Corro 1 are the children of the original members of Corro 1. 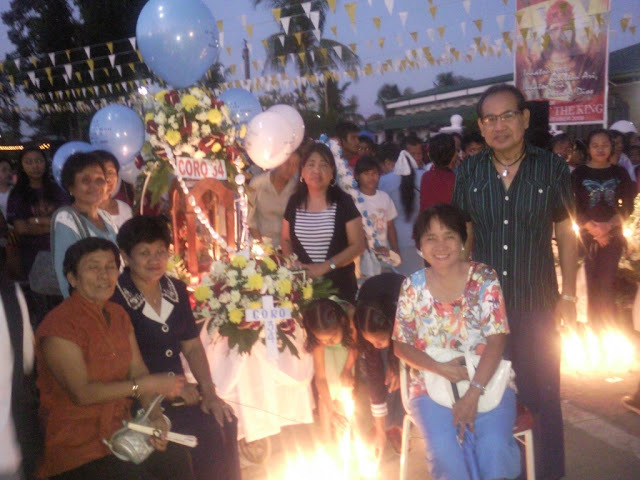 The first corro in San Fabian is thus more than 70 years old. Mr. Wenceslao Sagun narrated that during the Japanese time, i.e., 1941-1945, the statue which Corro 1 members are keeping today, was under his family’s care. It was hidden and protected by the Sagun family during the whole duration of World War II. Sa Fabian – 23 November 2009. Barangay Sagud Bahley held its Barangay Visitation for nine days instead of the usual one week. The Vicariate celebration of the Solemnity of Christ the King moved the Farewell Mass from 21 November, Saturday to 23 November, Monday, a day after the Christ the King celebration. The image of the Divine Mercy and the Blessed Virgin Mary were carried in the procession in honor of Christ the King. 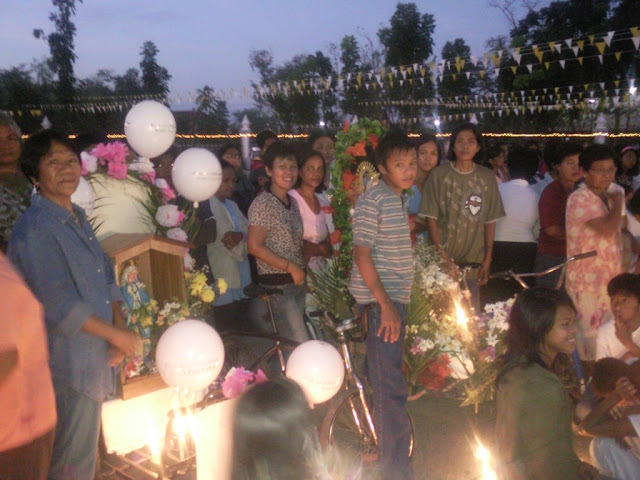 Thus, they had to be brought from the barangay chapel of Sagud Bahley to the parish church on 21 November. The Farewell Mass was celebrated by Fr.Oliver E. Mendoza. There were 16 children who received the Sacrament of Baptism. 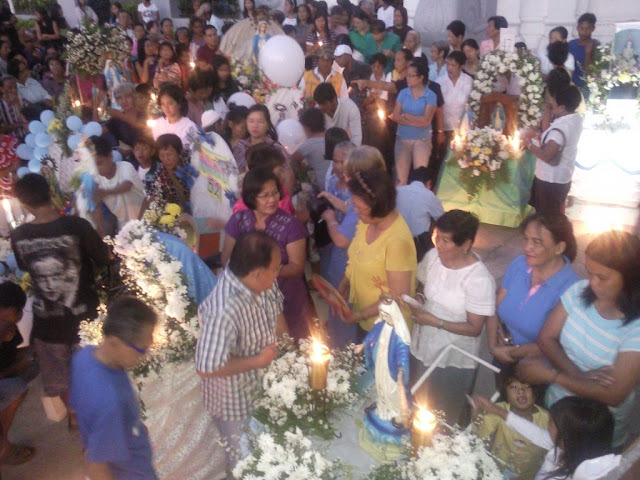 The images were brought in a procession to Barangay Poblacion after the Farewell Mass. To see more pictures of the Visitation in Barangay Sagud Bahley, please click HERE. San Fabian – 22 November 2009. Fr. Soc with members of the Accommodations Committee of the Christ the King Celebration 2009, just before the Holy Mass. San Fabian – 22 November 2009. The Parish of St. Fabian, Pope and Martyr hosted this year’s Vicariate III, Our Lady of the Rosary, celebration of the Solemnity of Christ the King. The parishes of the Vicariate III are: Parish of St. Fabian, Pope and Martyr, San Fabian; Parish of St. Thomas Aquinas, Mangaldan; Parish of St. Joseph, the Patriach, Mapandan; Parish of St. Hyacinth, San Jacinto; Parish of Our Lady of the Holy Rosary, Manaoag and Parish of the Holy Cross, Laoac. The parishes take turn in hosting the annual celebration of the solemnity of Christ the King. 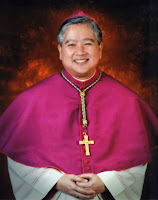 The new Archbishop of Lingayen-Dagupan, Most Rev. Socrates B. Villegas, DD, was the main celebrant. The priests of the Vicariate con-celebrated with him. They priests who joined the celebration were: Fr. Rene E. Mendoza, Fr. Genaro Herramia, the Vicar Forane, Fr. Alvin Platon, Fr. Manuel Sayson, Fr. Jose Laforteza and Fr. Raymund Manaois. The Vicariate III youth held a youth camp and vigil in celebration of the Christ the King. The youth camp was held in the afternoon of 21 November 2009. The overnight vigil started with a mass celebrated by Fr. Alvin Platon i n the evening of Saturday, the eve of the solemnity of Christ the King. There were about 800 youth who participated in the camp and vigil. There were talks given by priests of the Vicariate in the afternoon of Saturday. In the morning of Sunday, the youth went to some Barangays and joined some families in reading and sharing the Bible with them. The celebration began with the exposition of the Blessed Sacrament by Archbishop Socrates Villegas. The Blessed Sacrament was then carried in the procession participated in by the hundreds of parishioners from the parishes of Vicariate III. The procession started at 2:00 PM. The youth of the Vicariate joined the procession after an overnight vigil. The Honor Guards of the Knights of Columbus accompanied the Blessed Sacrament as it was being carried during the procession. The statues of St. Fabian, the patron of the parish, and the Blessed Virgin Mary and the image of the Divine Mercy were also carried during the procession. Msgr. Socrates Villegas and the priests took turn in carrying the monstrance. As the Blessed Sacrament was being carried in the procession, the people were seen kneeling in adoration and thanksgiving. The Benediction was given by Msgr. Socrates Villegas after the procession. Mayor Mojamito R. Libunao led the Consecration of Mankind to Christ the King. Msgr. Socrates Villegas was the main presider of the Holy Mass. In his homily, Msgr. Socrates Villegas spoke about the meaning of the Sign of the Cross. He urged the people to make the sign of the cross as a sign of their dedication of their mind, their love and action to Christ the King. Fr. Genaro Herramia announced to the people that unless the Vicariate celebration of Christ the King would not be held next year, the next host of the celebration of Vicariate III Christ the King is the Parish of St. Hyacinth, San Jacinto, Pangasinan. To see more pictures of the celebration, please click HERE. San Fabian – 14 November 2009. It is the turn of Barangay Cayanga to welcome the image of the Divine Mercy and the statue of the Blessed Virgin Mary as part of the Barangay Visitation Program of the parish. Barangay Cayanga hosted the Visitation from 7 – 14 November 2009. The images were received by them from Brgy. Longos Central. The images were carried in a procession on the first day of the visitation around the barangay. Nightly vigils were scheduled, and different groups were on hand to keep vigil. The Adult Formation seminar was held on 13 November 2009. The Farewell Mass was held on 14 November, Saturday with Fr. Oliver E. Mendoza as the celebrant. It was held at the yard of Sis. Aurea Ballesta. To see more pictures of the Visitation in Brgy. Cayanga, please click HERE. Liturgical Greeters and Usherettes of the Parish of St. Fabian, Pope and Martyr with Rev. Fr. Oliver E. Mendoza, Parish Priest. San Fabian – 7 November 2009. The waters had receded and the mud had dried, weeks after the flood of 9 October 2009 submerged Barangay Longos Central. 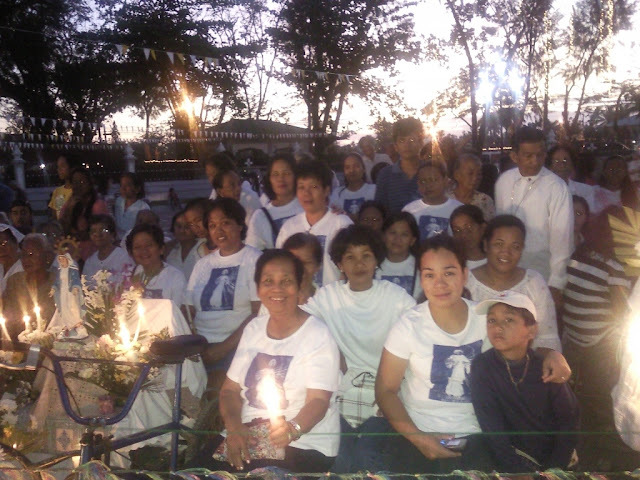 In an expression of gratitude and hope-filled trust in God’s Mercy, the residents of Longos Central welcomed the sacred images of the Divine Mercy and the Blessed Virgin Mary. The Adult Formation Seminar was held last 6 November from 5 pm to 9 pm; while the Youth Encounter was held from Friday evening to Sunday afternoon of the same week. 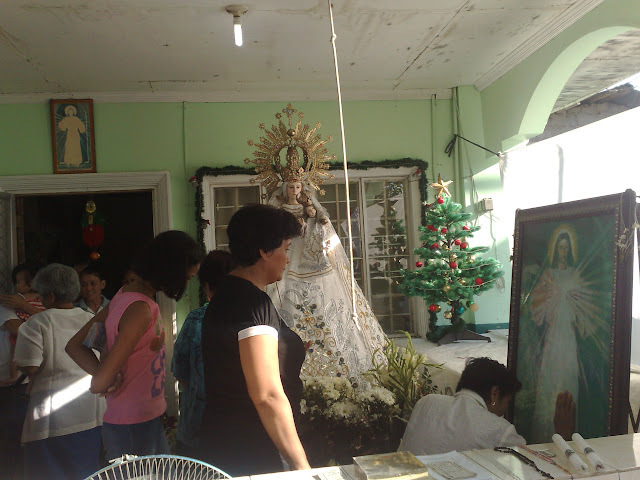 The sacred images stayed in the barangay for a week from 31 October to 7 November. The Farewell Liturgy was held after a week on 7 November 2009, Saturday. The mass was celebrated by Fr. Oliver E. Mendoza, the parish priest. A lone child received the sacrament of baptism. The participants of the Youth Encounter had their confession with Fr. Oliver. 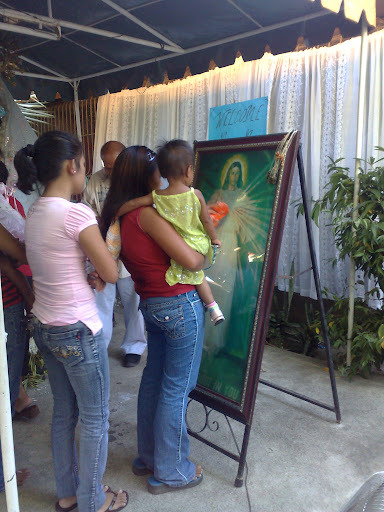 The residents held a procession to bring the sacred images from Longos Central to Barangay Cayanga, the next host of the barangay visitation. 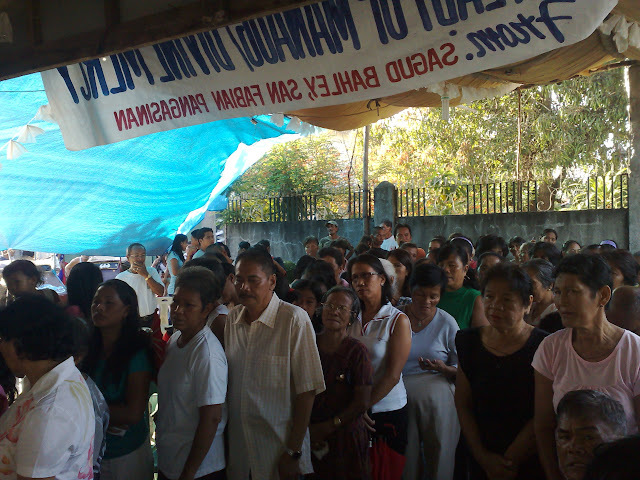 To see more pictures of the Barangay Visitation in Longos Central, please click HERE. More pictures of the Canonical Installation of the Most Rev. Socrates B. Villegas, DD as Archbishop of Lingayen-Dagupan (4 November 2009, 10:00 AM) at the Metropolitan Cathedral of St. John the Evangelist, Dagupan City. Taken from the website of the Archdiocese of Manila. Photos by Noli I. Yamsuan. Inararok ya totoo'y Dios: Agko amta no pano’y mansalita na salita yo dia. Ibangat yo ak kumon no bilbilang aliwa so pansalitak o panangibagak ed salita yo. Labay kon aralen so salita yo dia. We are the salt of the earth, the Lord said to us in the Gospel. Pangasinan was named after asin --- panag-asinan. We who form the Catholic faithful in Lingayen-Dagupan, living in the province that is named after salt, must truly be salt for society and salt for the rest of the world. Like ASIN, let us embark together on mission for social transformation and Church renewal. A is for apostolic action nurtured by prayer. Our first and only power is the Lord and our first and only way to the Lord is love. We must pray but it is not enough to pray. Our prayer must make us think and talk and listen and act and be like Jesus --- that is the apostolic action that we need in the Church. Any pastoral action or assembly that does not come from prayer will fail. Any prayer that does not lead us to apostolic charity will wither. Love without service is mere sentimentalism. Service without prayer is social activism. No anggano maminsan et asin tan belas labat so kakanen tayo, agtayo kumon lilingwanan so dignidad tayo a sakey ya anak na Dios. Pangasinan, bayang mayumi, asin ng pamayanan. Bagong lasa and handog at sariwang kasiglahan. Pangasinan, aming Ina, aming mahal, aming hiran! Lagi naming gnililingon, tinatanaw na kagandahan. Ipagbunyi ang Pangasinan, ipagdangal ang Maykapal! Archbishop Socrates B. Villegas, DD with the clergy of the Archdiocese of Lingayen-Dagupan immediately after the canonical installation of Archbishop Soc. 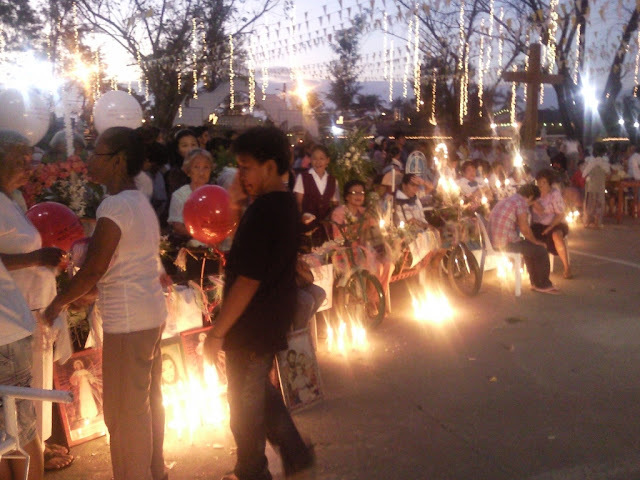 31 October 2009 – San Fabian. Barangay Longos Parac-Parac is the host of this week’s Barangay Visitation of the images of the Divine Mercy and the Blessed Virgin Mary. It stayed in the barangay for one week, from 24-31 October 2009. On the last day, the whole barangay went out for the farewell mass and the procession. It was one of the biggest gatherings for the weekly Barangay Visitation. After the mass, there were 39 children who received the Sacrament of Baptism. There was one couple who received the sacrament of Matrimony. Longos Parac-Parac has no chapel. The regular monthly mass is celebrated at the Day Care center. The barangay is considered one of the more depressed areas in San Fabian. During the last typhoon that inundated San Fabian, Longos Parac-Parac was one of the barangays that was heavily flooded. Included in the visitation is Longos Amangunan which is a sitio of Longos Parac-Parac. The sacred images were placed at the stage of the barangay where a makeshift shelter was built. The procession brought the sacred images to the next barangay, Longos Central. To see more pictures of the Barangay Visitation in Longos Parac-Parac, kindly click HERE.